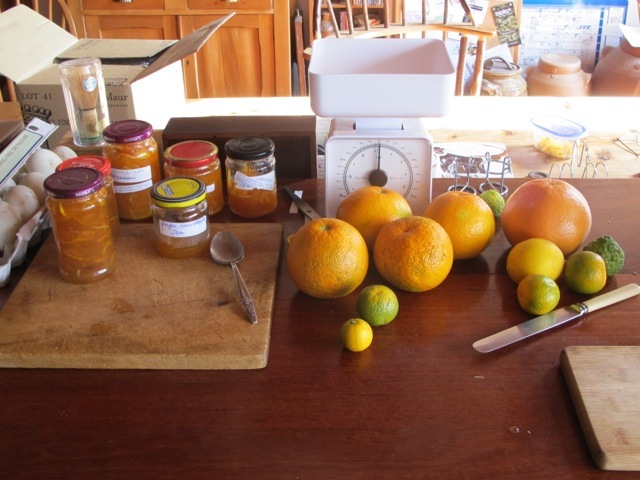 Making marmalade on a sunny winters morning. I’ve found the time to make some more marmalade. 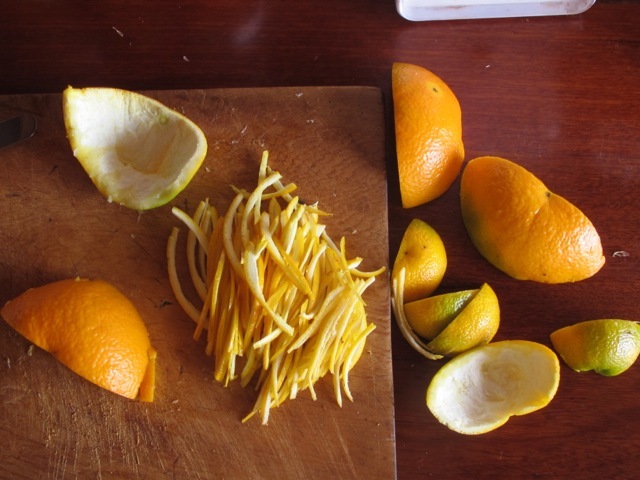 The citrus trees have fruit to be picked, so I make the time and manage 4 batches throughout the day. I use mainly Seville oranges, but I also like to experiment, we have tangelos, lemons, ruby grapefruit, nagami cumquats and Italian bitter chinotto. 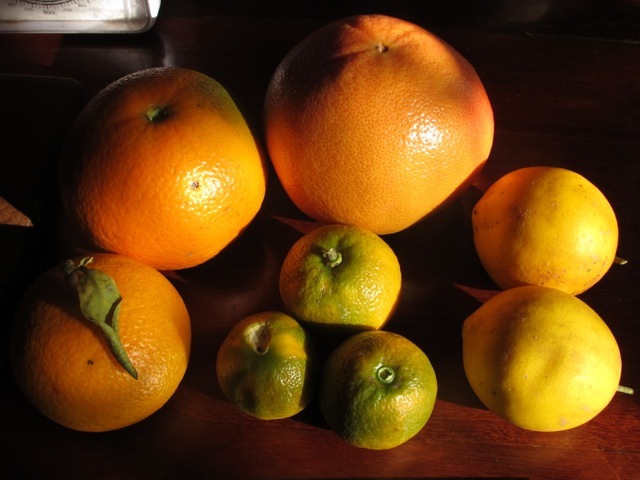 The Sweet One has already made the tangelo/seville mix. She does everything so properly, measuring out the ingredients to a recipe. Her marmalade always works. She is so sweet, she even adds the correct amount of sugar. I tend to make mine with a little bit less sugar, as I find some marmalade far too sweet for my taste. I have reduced the sugar to 300 grams to 1kg of whole fruit. I juice the fruit and add it into the pan, and that is the only licquid that I use. 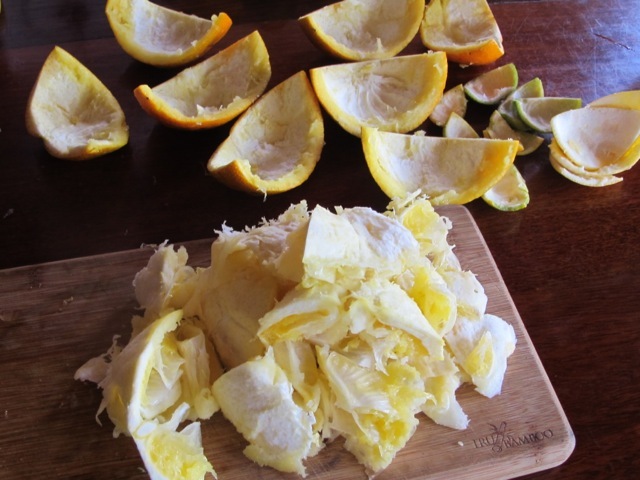 Then I scrape out all the pith from inside and discard it to the compost. i havent weighed this pulp, so Im not too sure what the final balance of sugar to peel ends up being, but it works. Next I slice the peel finely, add it to the pan and lastly weight out 300g of sugar and toss it on top. I bake it in the bread maker, set to ‘jam’ setting. I know that it doesn’t sound like the sort of thing that I’d normally do. I’m usually so hans-on. But it works so well. 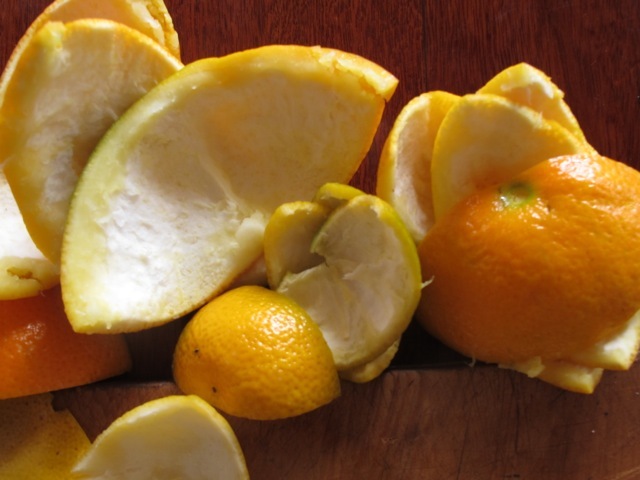 I don’t use the pips, nor do I soak the peel overnight. The machine does a perfect job of it in one hour, while I get on with other things. The ruby grapefruits are on at the moment so we are having one each morning before breakfast to cleanse our pallets and freshen us up to start the day, beautiful glowing colour and sharp astringent sour/sweet pulp. 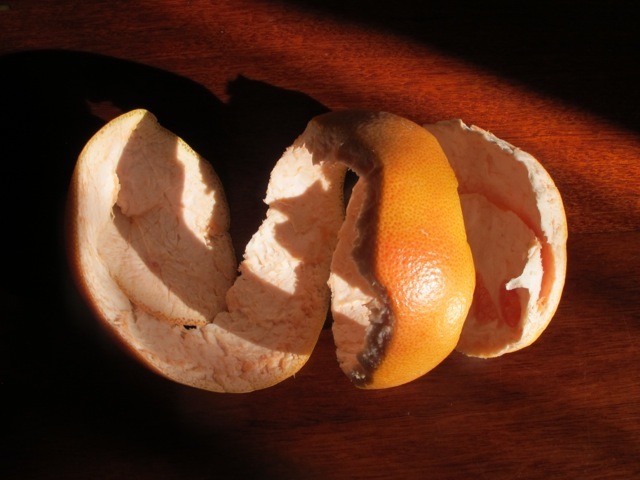 After we have had our ruby grapefruit for breakfast, which The Sweet One has peeled in one long twisted strip of peel. I see that it looks so great. 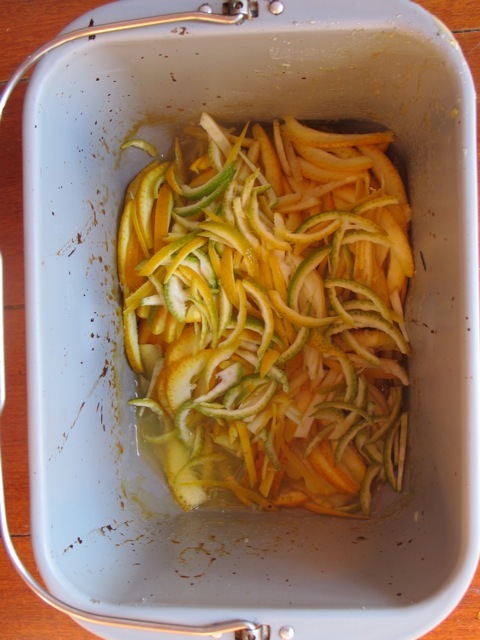 I don’t want to waste it, so I decide to add it to the next batch of marmalade. 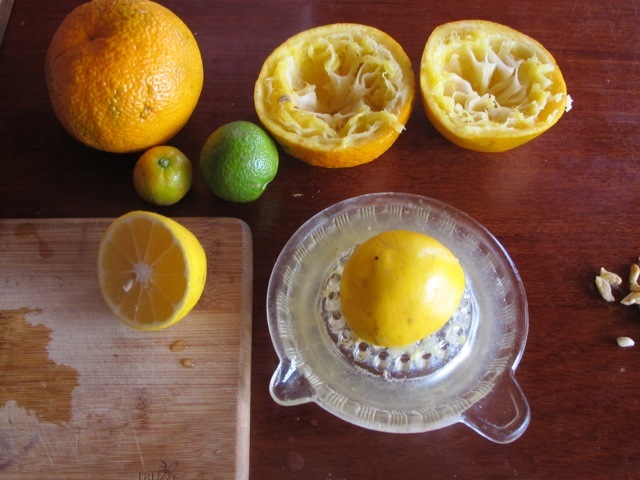 I will mix it with Seville orange and Myer lemon, with the addition of the finely sliced up twisted grapefruit skin from breakfast and a bitter Italian chinotto. In this way I can call this batch of marmalade ‘bitter and twisted’.